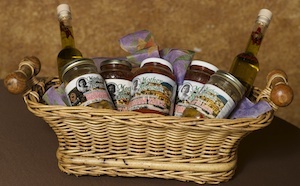 Mother Teresa's Gift Baskets come in all price ranges and sizes. Our Gourmet Gifts make perfect gift items for a man's office party, gift giving needs for corporations, holiday cooking treats for women, house warming parties, corporate business to business gifts exchanging and more. Also - don't forget that our products are great for those vegetarian diets. If you are on a low cholesterol or low fat diet, you will enjoy reading our nutritional facts. No sugar is added to our products, no salt is added - our products are flavorful without adding the sodium, and no gluten is used in our cooking process. Our gourmet products are delicious, heart healthy, meatless, low-fat and great for cholesterol restricted diets. Our gourmet gift baskets can be shipped to your home or business office. We ship anywhere in the United States, Alaska and Hawaii. All major credit cards accepted. Consider one of our Business Gift Baskets which start at only $35.95! Pasta Sauce, Marinara Sauce, Extra Spicy Sauce, Italian Dressing, Mediterranean Mushrooms, Mediterranean Garlic, Mediterranean Giardenera and Mediterranean Caponata. Simplicity is wonderful! 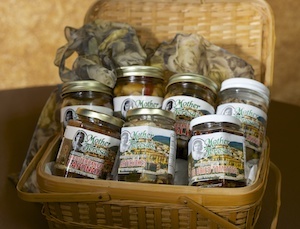 Italian food baskets perfect for housewarming parties or hostess gifts. 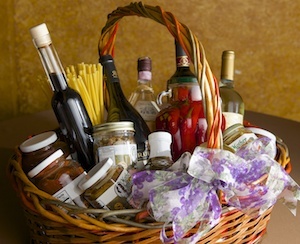 This Italian gift basket will be a special treat for new homeowners. Say congratulations and bring over home cooking gifts for those new home owners. Celebrate with them at their house warming party and send thoughts of Buona Fortuna! Or, just simply say Thank You! to the hard working hostess for making an event special. Oh! the comfort of a loaf of hot bread and a crispy green salad. Authentic italian cooking will always cater to the appetite hungry for southern italian comfort foods. When you want hot bread and olive oil, think Italian! Simply, relax, eat and enjoy. Choose your gift crate contents. Your choice of: Extra Virgin Olive Oil & Mother Teresa's Italian Dressing, 18 oz. - or - Mother Teresa's Balsamic Dressing Dipping Sauce & Mother Teresa's Italian Dressing, 18 oz. Eat right and live longer! Remember, our products are heart healthy, cholesterol free and low in sodium. You supply the love and hot loaf of Italian bread! 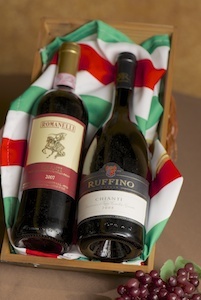 The Italian foods in this basket make a great business gift for that home or office party. The delicious food items in this gift basket are easy to display and serve. "From Mother Teresa's kitchen to your dining room table. Salute!!"